Christmas just came early folks!!! One of my favorite shows of all-time is on DVD. 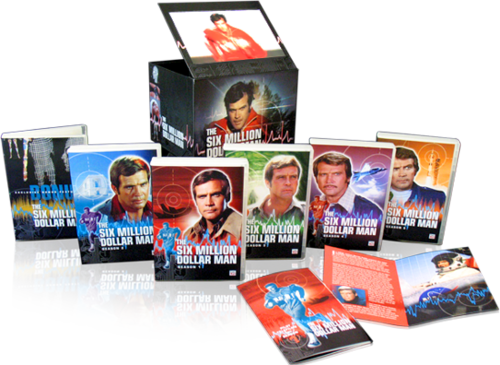 The Six Million Dollar Man: The Complete Collection” is available this week on DVD. It’s one of the few classic TV series that never has been available on home video in this format, so the release of this 40-disc set is a big deal. Lee Majors starred as Col. Steve Austin, a critically injured NASA pilot whose body was cybernetically rebuilt, making him the first bionic man. Outfitted in a Muscular Completist’s Set Sporting Sound Effects and Limited Edition Lenticular Graphics, the Spectacular 40-Disc Collection Will Feature All 100 Hour-Long Episodes and More Than 15 Hours of Bonuses Including the Three TV Pilot Movies, the Three Reunion Movies, and the Bionic Woman Crossover Episodes. Unaired Pilot: The Tim Kring Cut with Audio Commentary – A full 73 uninterrupted minutes of the original, unaired, extended pilot episode, as Heroes’ creator Tim Kring first envisioned it, with a character never seen. Special Effects – The secrets behind the eye-popping visuals that give the Heroes their amazing powers. The Stunts – A back stage look at the show’s hair-raising stunts. Mind Reader – Matt Parkman’s mind reading abilities reveal your inner Hero with a series of simple tests. Profile of Artist Tim Sale – A look at the Eisner Award-winning comic book artist (Spiderman, Batman, Daredevil) behind much of the Manga-influenced artwork used in the show. The Score – Go behind the scenes with Wendy Melvin and Lisa Coleman (of Prince’s The Revolution) as they create their ASCAP Award-winning musical score.